Today, we reconfirmed that the measurements for the arms were correct. We rechecked the aircraft was level. We dropped the plumb bob from the leading edge again and marked the spot. 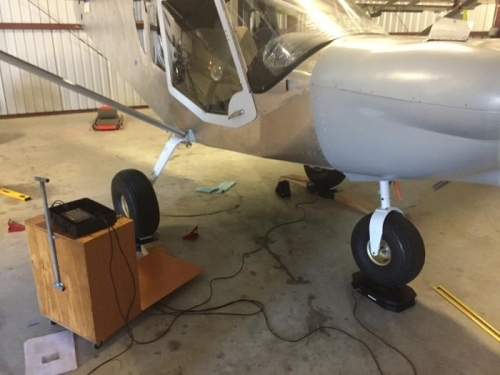 We used the digital level to insure we had the exact center of all wheels and then measured from each main and nose gear to the datum line. We came up with 28" for both mains and 29" for the nose wheel. Once we had the measurements we broke out the scales. 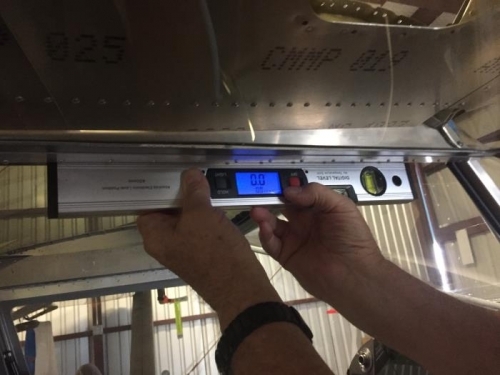 Thanks to our EAA 302 chapter we were able to borrow the scales. The weight turned out to be 315 lb Rt main, 311 lb left main and 236 nose wheel. Since the scales are for an auto there is a fourth reading that is extraneous. 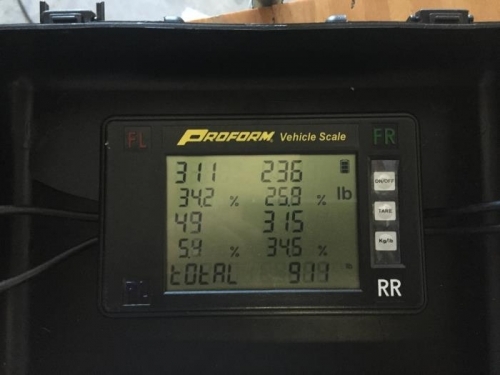 We subtracted it, 49 lb, from the total on the screen, 911 ibs. The total turned out to be 860 lb. About 40 lbs heavier than I expected but realistic I guess since we have the tundra tires, 2 batteries and autopilot servos. I did some initial W&B calculations and it is looking like half fuel tanks for my wife and I to remain legal at 1320 lbs. Need to shed some personal weight.